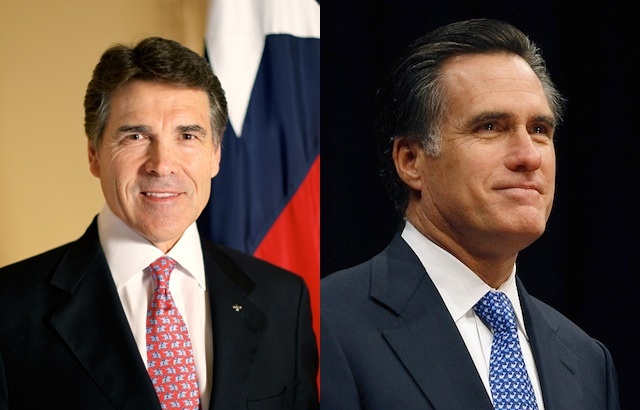 Last night CNN hosted a key Republican Presidential debate, in which Rick Perry took a variety of attacks. This is critical because going into Rick Perry’s first debate, his favorability ratings were great, and his unfavorables were miniscule compared with the field. Let’s see where CNN had the state of the race going into last night. Facts of the poll: ORC International for CNN, 1038 adults, 943 RVs, polling both land lines and mobiles. MoE 3 for both samples. 446 Republicans made a key subsample, with MoE 4.5. Among Republicans, Rick Perry treaded water since the before his first debate. He gained no ground, but when you lead 30-17, keeping a 30-18 lead over Mitt Romney isn’t necessarily a problem. That’s with Sarah Palin skewing the results. Without her, Perry went from 32-18 to 32-21. The big moves were in third and fourth place, with Ron Paul going from 6 to 13, and Michele Bachmann falling from 12 to 7. Could Paul conceivably be winning Bachmann voters? This poll unfortunately did not directly poll favorability ratings, which I believe are the key bellwether to determining whether Rick Perry can sustain his polling surge. But, we can look this question: “Next I’m going to read some names and ask how you would feel if each of them won the Republican presidential nomination next year.” Let’s see where Rick Perry matches up. Michele Bachmann draws 57% being Enthusiastic or Pleased, while 42% would be Displeased or Upset, for a net +15. Palin pulls a 55/44, +11. Paul showed 51/48, +3. Romney drew a whopping 76/25*, +51. Rick Perry managed to beat that even, at 77% positive and 21% negative, for a +56 net positive feeling if he were to win the nomination. Going into last night’s debate, having debated once, Rick Perry is still the best-liked Republican candidate, among Republicans. If that drops below Romney though, I predict Romney will regain the frontrunner spot. These are the numbers to watch, not the top lines, in my estimation. * These numbers I assume are rounded off, and so do not necessarily sum to 100.